Two weeks ago. Sunday morning. Just before church. I checked Facebook on my phone. I read a story that punched me in the stomach. Eight Christians had apparently been crucified in Iraq by ISIL. Martyred. The story wasn’t this one – but it was pretty much like it. Standing up to preach about our crucified king, Jesus, became realer for me in that moment than it had ever been before. Martyrdom has a special place in the hearts of Christians because it’s how it all started. Our martyrs don’t die in a bid to take other lives with them, our martyrs die to give life to others. Our martyrs lay down their lives to follow our martyred king. Jesus. It turned out the story was a couple of months old and had taken this time to reach Facebook in Australia. The situation hasn’t improved in those intervening months. Between May and now. It has deteriorated. ISIL has systematically removed those who oppose their rule – both Muslim and Christian – through violent persecution. To the point that Obama has launched a military intervention in the region. To prevent genocide. Obama’s speech, launching this action isn’t silent on the persecution of Christians (even if most western media covering the story seems to be avoiding it). Here are some good things to read about how changing your profile picture can be a helpful thing to do, and an expression of solidarity with our persecuted brothers and sisters by David Ould (and a follow up) and Dave Miers. I haven’t changed my profile picture. Still. Partly because I’m a contrarian and am worried about the tokenism of ‘awareness raising’ in the face of helpless situations. Partly for reasons I will explain below. I have found the exercise useful for keeping me praying about these events as the symbol dominates my news feed. There are good ways to give money directly to people affected by the situation – the Bible Society or the Barnabas Fund would be good places to start. It’s worth thinking of ways to support non-Christians targeted by ISIL as well. I’m praying that the Christians fleeing Iraq will have opportunities to love and care for their country people also fleeing this oppressive regime. My Facebook feed is also filled with people praying for and expressing outrage over the persecution of Christians. Rightly so. The stories coming out of Iraq – particularly those from Canon Andrew White, an Anglican minister in Iraq, including this story that ISIL is beheading Christian children. That’s such an awful sentence to write. Writing it now pales in comparison when it comes to how White must feel sharing this news with the church globally. My friends sharing these stories and changing their profile pictures are expressing a sense of hopelessness – this seems so present, in our interconnected and globalised world, and yet so far away. So very far away. Far from our experiences of life in a beautiful country like Australia, and from our ability to help bring change. There is so little we can do. My friends are sharing these stories and changing their profile pictures because they want to raise awareness of what’s going on for fellow Christians. My friends are sharing these stories and changing their profile pictures because they want people to be praying. Which must surely be the response to events such as these. These are all good motives. I’m not writing this to cheapen the awful reality for other people living through an experience so far removed from my own. I’m not writing this lightly. If this is not true, then Christianity is not true. Or. Perhaps. If Christianity is not true. This is not true. There is hope for those suffering in these events. Despite the awful atrocities being committed against Christians. Despite the horror of what humans can do to one another in the name of religion. Despite the carnage. There is hope. The hope doesn’t rest in Obama launching airstrikes. The hope rests with the one who went to martyrdom to pave the way for Christians everywhere. To secure a certain future. The Apostle Peter, who was, as legend has it, crucified upside down, spoke of this hope. A living hope. In his letter to the persecuted church. I love the link David Ould’s post makes to the Passover. That time in the book of Exodus, in a region not so far from where these events are happening, where the lives of people who put their faith in God were spared because their doors were marked with a symbol. Lamb’s blood. 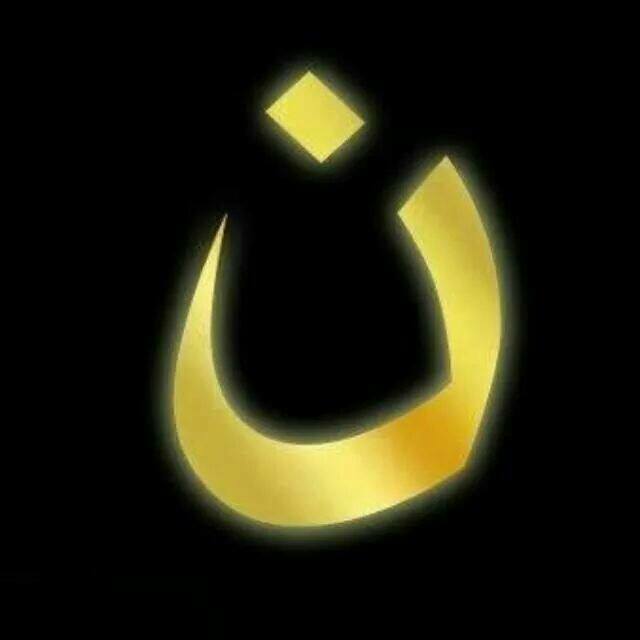 I like it because it’s a great reminder that whatever happens to these Christians – even to the point of the awful stuff being reported – they are marked not by ISIL with their feeble Arabic letter. But by the blood of Jesus. This is the symbol for Christians. The blood spilled at the Cross. While the n is marking out those who are associated with Jesus – the Nazarene, and this is nice, and appropriately theologically accurate, I think there’s a better symbol. A symbol that marks the moment God wrote his name on those who turn to him, the symbol that marks that first martyrdom – a symbol designed by another evil empire. Rome. A symbol that represents real hope, and opens martyrdom up as a way of life for Christians. Even when we’re not literally being crucified. Peter fronts up to a bunch of Jewish rulers in Acts 4, shortly after the death and resurrection of Jesus. And explains how the disciples are carrying on the work these rulers thought had died with Jesus. Just after they healed a crippled man. Peter says. I don’t know if I’m suggesting that Christians everywhere start changing their profile pictures to a picture of the Cross. Though maybe I am. I’m not sure what the exit strategy is for those who have changed their profile pictures. How long do we maintain this solidarity? I think there’s been plenty of good stuff happening as a result of the use of ن. And I’ve suggested a few ways to take concrete action at the bottom of the post (also check out the Bible Society’s list of 5 things to do – some of these are the same). At the end of the day it’s a pretty minor quibble to suggest the cross is a better symbol of Christian hope than the Arabic letter designed to associate people with Jesus. But it’s the Cross that subverts evil and oppressive regimes who seek to stamp out Christians. It’s the cross that was the symbol that encouraged the earliest Christian martyrs to follow the way of Jesus. Even to death. All of Tertullian’s Apology – a defence of Christianity to the Roman regime which was persecuting Christians in the hope of systematically wiping out the faith, is worth reading. Chapter 50 is particularly powerful stuff in the present context. Especially this bit. But go zealously on, good presidents, you will stand higher with the people if you sacrifice the Christians at their wish, kill us, torture us, condemn us, grind us to dust; your injustice is the proof that we are innocent. 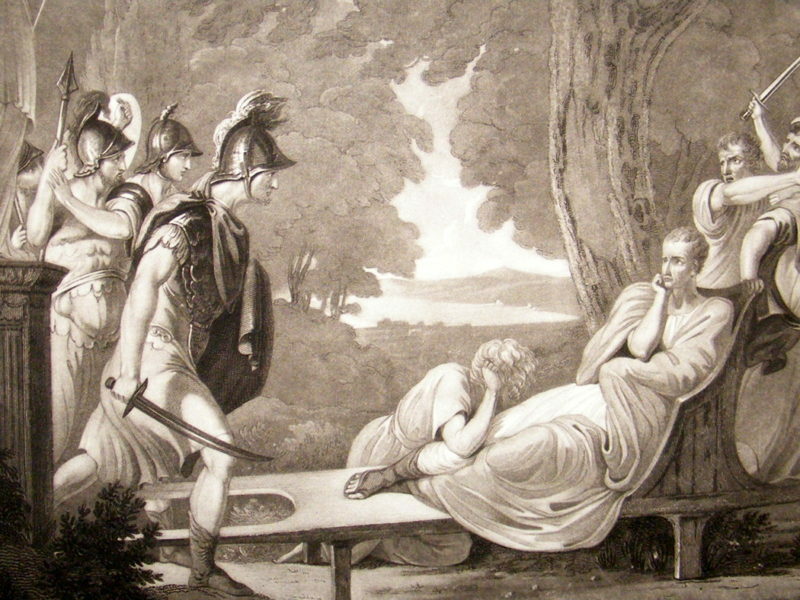 Therefore God suffers that we thus suffer; for but very lately, in condemning a Christian woman to the leno rather than to the leo you made confession that a taint on our purity is considered among us something more terrible than any punishment and any death.Nor does your cruelty, however exquisite, avail you; it is rather a temptation to us. The oftener we are mown down by you, the more in number we grow; the blood of Christians is seed. – Tertullian, Apology, Chapter 50. The last words from Peter’s first letter are also particularly worth reading in this present crisis. Words to persecuted Christians. Words I am praying our brothers and sisters in Iraq are reflecting on, words that give them hope, and give us hope as we watch events that seem to be hopeless. There is hope for the Christians being persecuted – even to the point of death. The symbol of that hope isn’t the letter the enemies of Christians put on their doors, it’s the way God opens a door for them. It’s the lamb’s blood of Exodus on a cosmic scale. The blood of Jesus. There is hope, and martyrdom is an expression of that hope. It’s a testimony to what Jesus has done for us. Revelation, another book written to Christians suffering incredible persecution, links the symbol of the blood of the lamb – spilled at the cross – with martyrdom (not shrinking from death) – suggesting this way of life (and death) is part of the victory Jesus wins over those who persecute. All of these ‘things you can do’ lists have a massive danger of being tokenistic things that are more for our own comfort and appeasement than for the comfort of others if we’re not prepared to shoulder the cost when the story falls out of your Facebook newsfeed. What does responding to the situation in Iraq look like next month? Next year? Whenever you change your profile picture back to a picture of your smiling face, or your cute kids, or whatever abstraction tickles your fancy? How are you going to keep going? If the hope people are dying for is real. If we really are children of God, like our brothers and sisters in Iraq. If we have confidence that what Jesus did at the Cross restores our relationship with the God who created all things by speaking, then we should realise that prayer is actually the best way we can respond to any situation. It’s real. Not a token gesture. I do like that Christians do awareness raising best out of everyone online – because the easiest and best response doesn’t cost us much more than the click of a button. It costs us speaking to God. What a privilege. I mentioned the Bible Society or the Barnabas Fund as options earlier. Voice of the Martyrs is another option. If you have another specific campaign to suggest – leave a comment. Wouldn’t it be great if Australia joined other countries like France in offering refuge to those experiencing these horrific atrocities? I know the global refugee situation is incredibly complex. But if what is going on is enough to provoke Obama to do something other than giving a speech, it must be a big deal. Can I suggest writing to Scott Morrison. A church going man. The Federal Immigration Minister. To suggest he might do whatever it takes to help protect our fellow humans (not just the Christian ones) who are suffering under ISIL, who are perhaps the closest thing to the physical manifestation of evil since the serpent slithered into the garden, or since Pilate washed his hands of the crucifixion of Jesus… There are other more recent examples of the kind of evil that systematically wipes out minorities, but to invoke them breaks the internet. You can write to Scott Morrison via the email address listed on this page. Here’s an example letter. But I’m sure you can come up with your own version. 4. Love those who have fled persecution already in our midst. I don’t know about you, and your church (or city). But in my church, and my city, there are those who have fled similar regimes – be it fleeing persecution in Africa, the Middle East, or anywhere. We’re often so quick to move onto new plights based on the news cycle (or current events, when the news cycle isn’t all that reliable). This love for our persecuted fellow Christians (and persecuted fellow humans) can’t just be token. It can’t be solved by the firing off of a prayer, the click of a button, the absolution of a one-off financial donation, or a passionate email to an MP. This is an issue we need to be in for the long haul. In. Costly. Painful. Real. World. Ways. How are you going to do stuff in the real world? It starts with doing stuff for those who have already escaped persecution. Those who are here in our country as a result of our migration program. And this isn’t just about caring for Christians. You can’t take Jesus seriously when he speaks about loving our enemies (not just our neighbours) – if you’re going to limit this sort of care to Christians. I’m not saying we shouldn’t care for Christians who have been persecuted. We absolutely should. But they share our hope. Or we share theirs. So maybe we should be looking outside the people who tick the same box as us on the census form? The best way to avoid tokenistic jingoism is to get your hands in the mix – to make others comfortable through your own discomfort (it’s very easy to write about martyrdom). Trust me. I’ve spent the last hour or so doing it). This is a massive challenge when we respond to this sort of thing as Christians. It’s a challenge I feel. I don’t want to change my profile picture until I’m sure I’m actually doing something to back up whatever is happening in the online space. Otherwise I feel like I’m in danger of being like the Pharisees who do a bunch of token religious stuff in public, so people will notice, but aren’t really doing much good in private. This isn’t a dig at those who have changed their pictures – I’m sure many of them are doing all sorts of stuff beyond just talking. But online stuff has a massive tendency towards the sort of thing Jesus nails in Matthew 23 when he smashes the Pharisees. I’m aware of the irony of writing this stuff on a blog. From my lounge room. Firmly entrenched in middle class Australia. But I need to stop being a slaves to the news cycle and figure out how this passion for the persecuted transforms my every day reality. Maybe you do to? 5. Don’t just do ‘token’ awareness raising. Don’t let the martyrdom of our brothers and sisters be in vain. All responses outside of the events, as they happen, have a tendency to feel like they’re token gestures. That’s one of my problems with anything that smells like clicktivism or awareness raising. When there’s so little being said about what is happening to Christians we (Christians) tend to feel like we’re being mistreated, vicariously. As if column inches in the news give us validation as Christians. As if we’re martyrs because our voice isn’t getting a run because of some insidious secular, anti-Christian, agenda. I’m not questioning whether such an agenda exists. I’m sure it’s possible. There’s been an anti-Christian agenda since the Roman rulers and the Jewish rulers got together to crucify Jesus. I’m not going to wring my hands because the Christian aspect of this genocide isn’t getting published by our western media. That seems to be missing the point. Members of our global family. Fellow children of God. Are being executed for their faith. This is an incredibly powerful testimony to the hope that they have. These brothers and sisters of ours have nothing like the freedom we have to tell people why they are giving up their lives. I’m not going to change my profile picture to raise the plight of my fellow Christians around the world as though the situation (as mind-blowingly horrible as it is) is hopeless. Nor am I going to change my profile picture without constantly reminding people that the Christians executed by ISIL have an amazing hope. This situation is not hopeless. Though we might feel like it is. This situation is not hopeless. It is created by hope. The hope in the midst of these horrific acts of genocide is the hope that has driven Christians to martyrdom since very soon after the death of Jesus. The hope of resurrection. Living hope. The hope Peter says we should always be out to share with others. This may seem like an empty, or token, gesture in the face of the systematic elimination of Christianity from a section of the Levant, but it is not. It is what is required for that elimination to fail. The proclamation of the tangible, martyrdom-inspiring, living, and real hope that is found in the death and resurrection of Jesus. “But even if you should suffer for what is right, you are blessed. “Do not fear their threats; do not be frightened.” But in your hearts revere Christ as Lord. Always be prepared to give an answer to everyone who asks you to give the reason for the hope that you have. But do this with gentleness and respect.” – 1 Peter 3:15. I appreciated your article very much. I read it along side that by Phillip Jensen. It articulated why I changed my Noon symbol for a while; I did not want to seem to be demonizing all Muslims – that it may have been a bit like the southern cross stickers on bumpers/biceps. I put it back because I understand it encourages our brothers and sisters, maybe like the fish in the sand…Trying to respond to atrocious persecution in line with NT. Which as you say – is ultimately to cling to the cross. Maranatha. Anglican Aid is conducting an appeal. Details above.